European manufacturers are teaming up to build a hybrid electric test plane. 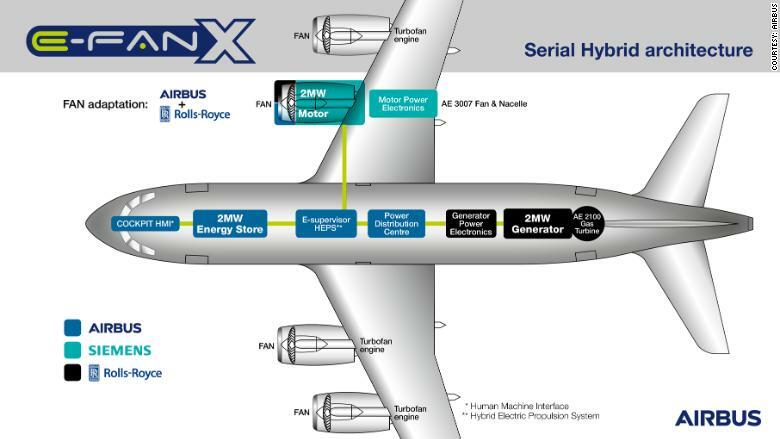 Airbus (EADSF), Rolls-Royce (RYCEF) and Siemens (SIEGY) said Tuesday that they want to trial a modified commercial aircraft partially powered by electricity in 2020. They said the project — called E-Fan X — will be based on a modified 100-seat BAe146 regional aircraft. The trio believe it could lay the groundwork for commercial flights with the same electric technology as early as 2025. The companies will start by using a two megawatt electric motor as one of the aircraft's four engines. If tests are successful, a second fuel-driven engine could be swapped out for an electric motor. 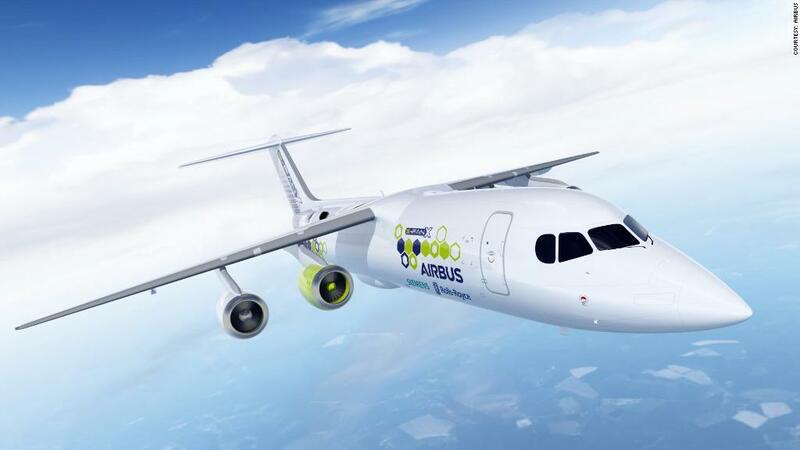 "The E-Fan X is an important next step in our goal of making electric flight a reality in the foreseeable future," said Paul Eremenko, Airbus' Chief Technology Officer. Each company will oversee a different aspect of production. Airbus is responsible for integrating the engines with flight controls. Rolls-Royce will develop the turbo-shaft engine, two megawatt generator and power electronics. Siemens will deliver the power distribution network. The three European firms are not the only ones betting on aviation's electric future. EasyJet (ESYJY), a major European carrier, announced in September that it is working with U.S. startup Wright Electric to build an all-electric airliner. Boeing (BA) and BlueJet have partnered up with a Seattle-based startup Zunum to develop a commuter electric aircraft. They said the plane could start flying in 2022. Both projects are ambitious in their scale and face major hurdles to get up and running without the experience and expertise of established players like Airbus, Rolls-Royce and Siemens. Commercial planes account for about 2% of carbon emissions that contribute to climate change, but the industry aims for carbon-neutral growth over the next decade through a combination of new technology and biofuels. Fuel is one of the biggest costs for airlines. -- Jon Ostrower contributed reporting.